Airdroid is one of my favorite apps when it comes to managing my phone or tablet. It is so useful that I almost never use a cable to connect my phone to my PC. If you have not used it already, you are missing out on a great experience. Surprisingly, it is a fully functional free app (as of December 2012), available for all devices running Android 2.1 or higher. All the above work over WiFi. Being the developer that I am, I couldn't help but think how it works. So, in this series we will be making our own app, which will have some functionality similar to that of Airdroid. Map the commands that it receives from the PC (which will be a client that connects to the HTTP server) to the API available in the SDK. 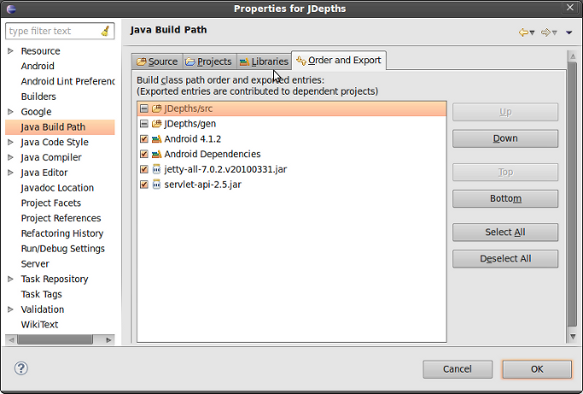 I again assume you do have some knowledge of the Android SDK and how to create an Android project in Eclipse. Determine and display the IP address of the phone, so that we can connect to it from the PC. WiFi functionality is rather erratic on the emulators. So, I recommend debugging this app using a real device. We don't need to actually create a HTTP server from the scratch. There are a lot of fully functional HTTP servers available that we can embed in to our app. So, we will be using Jetty for this purpose. It might not be the best choice, but it is quite easy to embed and use. Firstly, we must download the requisite JARs. Download both of the following, and add them as external JARs in your project. I have chosen Jetty 7 and Servlet API 2.5. Now that we have taken care of the dependencies, we get started with the code. There is a lot of documentation available about Jetty here if you are interested. That is all the servlet does. It is not specific to Android in any way. It is an ordinary servlet not making use of any special API. Now we will start using the Android API. We need to get the IP address of our phone, when it is connected to WiFi. Without this IP, we will not know what to type in to the address bar of a browser on the PC. It can be obtained using the following method. This should return a String that has the IP address. We will make this a part of our class that manages the Jetty server. Let us call this class, MyHttpServer. Our server should run on port 8080. As this server is going to deal with servlets, we will add a ServletContextHandler to it. The context path of the servlets for now shall be just /. To the ServletContextHandler we can add any number of servlets, but for this tutorial, we will only be adding one. Here is the complete code of MyHttpServer.class. * do this. I have seen the bug only on the emulators. * We better run the server in a separate thread. We are all done. Build the project, and deploy it to your Android device. Turn on the WiFi, and start the app. If all goes well, you should see an IP address on your phone screen. On your PC, which is connected to the same WiFi network, open a browser and type in the IP address you got followed by :8080 (the port). Hit enter and you should see the form which is being served by your phone. 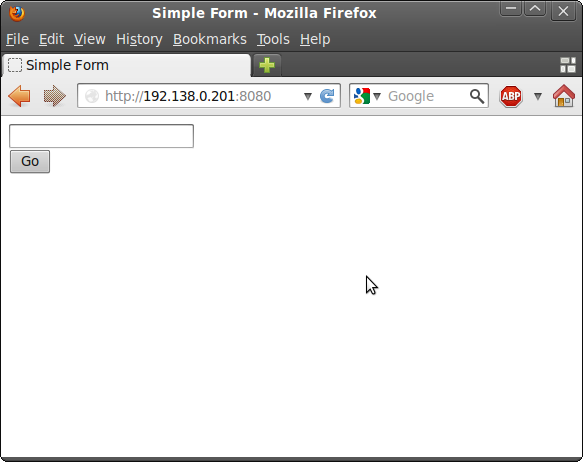 Alternatively, on your phone too, you can open up a browser and type in http://localhost:8080, and see the same form. Thanks for reading. If you have any comments, doubts or feedback, please do write to me. In the next part of this series, we will add the functionality to send/receive SMS from a PC.